Born November 1939 in Halifax, West Yorkshire where he has lived all his life John is the leader of the band and is responsible for bookings, administration and general public relations. His work load is onerous and often thankless and the rest of the band know they are very fortunate to have his unstinting efforts. Originally inspired by Gene Krupa in the film 'The Benny Goodman Story' John took up drumming playing in local Skiffle Groups, Dance Bands, and a Pantomime Pit Orchestra. During this work he met Terry Mellor, the originator of The Savannah Jazz Band and joined the band in 1979. 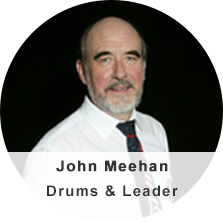 When not involved in band work, John enjoys walking, hill climbing, swimming and the occasional tipple of Malt Whisky. 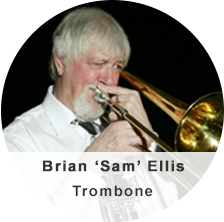 Born Wakefield, West Yorkshire, in January 1939 Brian or 'Sam' as he is commonly known joined The Savannah Jazz Band in 1988. Playing both the trombone and piano Sam's playing experience is impressive. He started playing about 1959 having heard a George Lewis recording which started the whole thing off. He bought his first trombone for £3-10s-0d (£3.50 in new money) and started playing to records. He heard the Humphrey Lyttelton band at Leeds Town Hall and was encouraged to form a band - 'The Maryland Jazzmen' which lasted for about 10 years including his National Service years. Other bands Sam has played in include The Yorkshire Jazz Band, Malcolm Webb's famous New Orleans Jazz Band, The Yorkshire Post Jazz Band, Dave Brennan's Jubilee Jazz Band, Chris Blount's New Orleans Jazz Band (including 5 tours of Sweden), the famous Heppy's Kalahari Bushmen and the Wakefield Arms Jazz Band. He still plays every Tuesday evening with The La Harpe Street Jazzmen. He has played all over Britain, Germany, Holland and Scandinavia. Born in Stockport, where until the 1960's a principal industry was hat making, his first band, which he joined at the age of 18, was appropriately The Jazz Hatters led by clarinettist Roy Rogers. National service in the RAF was followed by periods with the Dallas Jazz Band and the Mike Pembroke Hot Seven. During the mid 1960's he was involved with big band and dance band work but returned to the traditional jazz scene in 1969 with the Manchester based Smoky City Jazz. He became leader of the band in the 80's and for years the band has enjoyed great popularity within the Northern Jazz scene and Holland and Germany. Bill, who lives in Romiley, is the perfect lead for any band and he plays well as part of the team or on solos. His humour on the 'mike' and his way of involving the audience ensures everyone enjoys a good night's jazz. 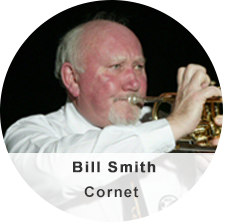 Bill mainly plays the cornet but is just as adept on the trumpet, flugelhorn, trombone, and harmonica and his vocals are always enthusiastically received. His excellent technique and versatility means that he is in great demand for dep. work with various styles of band. He lists Humphrey Lyttelton, Harry James, Wild Bill Davison, Muggsy Spanier, Pat Halcox and Alex Welsh as main influences on his style. Bill's main work load is playing with the Savannah but he still has regular work with several local bands. Roger is a product of Liverpool and remains a passionate Red. He attended the Merchant Taylors School prior to joining the Merchant Navy. His eight years at sea gave him ample time to practise his new clarinet with a captive audience. After his sojourn at sea he returned to land and crossed the border to Yorkshire where he joined the Vic Bevan Band. After 3 years with Vic (still playing in East Anglia) he 'transferred' (fee undisclosed) to the excellent Mick Shore Band where he stayed for 11 years. Roger then disappeared into the wilds of South Africa (his words) to work in two steel producing plants but still managed to blow in Jo'burg. A year later he returned home and joined the Leeds jazz scene with the Ed O'Donnell Band and ran the resident band at the Barnsley Jazz Club. This led to the formation of the Yorkshire Post Jazz Band with Dennis Armstrong. Thirteen years later (the years are totting up) he joined Phil Mason's internationally renowned band of All Stars. Another 12 years passed and after Phil retired he was approached by John to join the Savannah Jazz Band. 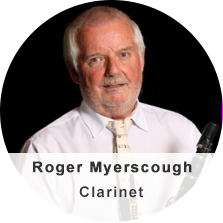 He tells the story that when John asked him to join he said 'I bet I'm the tenth clarinet player you've asked' and John simply replied 'No Roger – the eleventh'. He knew then that he was joining the right band. However, with his CV recorded here and if my arithmetic is correct some 48 years of experience I'm sure he was no lower than the fifth. Unfortunately, Roger having spent so much of his time in Yorkshire now lives in Essex. However, as the band is busy in all parts of the UK and Europe this is not the disadvantage it may seem. An Acker Bilk LP, bought for me by my parents, sparked my interest in the music from the age of about 12. Acker's then banjo player Roy James has a lot to answer for, as his playing with this band inspired me to (eventually) take up the instrument. I still regard Acker's Paramount Jazz Band as the outstanding band of the British trad boom, and their wonderful swinging style, from the late fifties Pye Nixa recordings through to their hit singles on the Columbia label of the early sixties, became for me one of the main ingredients of what did, and still does it for me in terms of traditional jazz. This introduction also led me to discover, with an excitement that I still vividly remember, the early recordings of the pioneers of the music, Joe Oliver, Jelly Roll Morton, Bix Beiderbecke and of course, the for me peerless, Louis Armstrong. The sensational recordings of Louis's Hot Five include for me, some of the most exciting jazz ever recorded. I first played, in the 80's, with bands in my home county of Kent, mainly with the Bill Barnacle JB, and the eclectic approach of this band proved to be a great apprenticeship. I have many happy memories of these times, and I am very appreciative of the breadth of jazz styles that this band introduced me to. A recording of a session I did with another Kent based band led to an invitation to play with Max Collie's Rhythm Aces, an astonishing thing to me, since the high energy, swinging sound of this band in its 70's heyday was then, and still is one of my favourite things. I happily played most of the band's gigs between '92 and '98. After this, I played regularly with Pete Lay's Gambit jazzmen for some eighteen years, but a move to Lincolnshire in 2009 meant that the travelling required was unsustainable and I eventually left Gambit in January 2015. Since the summer of 2013, I had been working with both Gambit and Savannah, since my location in Lincolnshire made it a possibility for me to help-out with Savannah's requirement at that time for dep. banjo player. Since 2015 however, I have been able to make a full commitment to Savannah, and I am greatly enjoying the experience of being the band's adopted southerner! 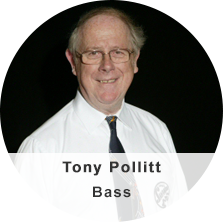 Born on the western side of the Pennines in February 1940, Tony started his present spell with The Savannah Jazz Band in 1990. 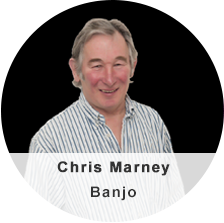 He started his 'musical career' at the age of 13 learning to play the clarinet until at the age of 16 and several instruments later he had progressed to the T-Chest bass in a pub skiffle group. He joined The Dallas Jazz Band using a borrowed bass held together with chicken wire, glue and six inch nails. He purchased his present bass using 'engagement ring money' thus postponing that event. He next joined Mike Pembroke's Hot Seven before becoming one of many musicians who passed through the various Keith Pendlebury formats, his spell with this band lasting 8 years. Tony's musical career has seen many interruptions due to business commitments but in amongst these he had spells with the Smoky City Jazz Band, Ged Hone's Big Four and his first 12 month spell with The Savannah Jazz Band following the death of Terry Mellor, the bands founder. There is never a shortage of fun, excitement and raw good music whenever the Savannah Jazz Band takes the stage. The Savannah is one of the most popular UK bands around. With their talent for satisfying listeners and dancers alike they have built up a truly international reputation atmajor festivals in the UK and overseas. The band's driving and exciting New Orleans style attracts large audiences whenever they play. Their many fans follow them from festival to festival and turn out devotedly to see them at regular venues in the UK. This tremendous support is very much appreciated by the band. However, the band's reputation has not suddenly emerged; it has been hard earned and well-deserved for nearly 4 decades. Formed in 1979, The Savannah started their swinging Thursday night sessions at the Station Tavern at the railway station in Huddersfield, West Yorkshire, and followed this with a residency at the Royal British Legion Golcar for 6 years. This ended in 2012and the band now has a residency at Didsbury Cricket Club, Manchester on the second Thursday of the month.